A big corporate company has a long term as well as short term strategy to ensure that they are reaching the business goals. This type of planning - a 3-year plan - is something I learned and lived by when working as a marketing project manager for a big global car brand, before I started Bear Bell Productions. If you've followed along with step 1 and 2 of this process you now have set the big goal you want to reach in 3 years, with the help of defining your vision and mission. You have also set some measurable objectives that help you understand what that big goal is about - the areas and functions you need to work with in order to make it happen. But what we’ve done so far is set goals and objectives for where we will be in 3 years from now. What about the time up till then? No matter how clear the big goal is to us now - 3 years is a long time and that big goal still feels pretty far away, right? That’s why we need to find some goals closer in time and to where we are right now. In this step we are going to build a bridge over that abyss of uncertainty, or we could call it a ladder of steps to climb towards the end goal. The bridge/ladder will be of both qualitative and quantitative nature. Actually we are going to repeat step 1 & 2, but with year 1 & 2 in mind instead. We’re going to define a specific vision for both year 1 and 2 as well as setting measurable objectives/ratios for each vision so that we can see what defines them. In the corporate world these yearly visions are called milestones and the yearly objectives are called ratios. First we’re going to set the fluffy, qualitative milestones and we’re doing that backwards, starting with year 2. And if we take our previous example of the little design business with the big goal of becoming an established and hired pattern designer in 3 years (see step 1 article), what would probably be a reasonable step towards that end goal? What state would precede this? What would you be before becoming established and hired? What comes before established? I’m going to share something that my karate sensei has taught me and that is a great parable for this process. In the karate form that I’m training (Shotokan) we do something called a Kata. It’s a set of standardized techniques and positions that are performed in a defined sequence and pattern - almost like a dance. Step 1 is about learning what techniques and positions are included in the sequence and in what order they are performed. It’s about memorizing with your mind. Step 2 is about practicing. Practice, practice, practice what you’ve learned. Perfecting your skills more and more and memorizing with your body - your muscle memory. Step 3 is doing. In step 1 & 2 you have acquired and perfected your skills, the positions and techniques and now you are able to perform the kata correctly. So when you are up for graduating to a new level you are ready. You just get up there and do it. We can use these steps as inspiration when we set our vision milestones as well. So to answer the questions I asked above - what comes before being an established and hired pattern designer? Using my karate story it could have to do something with practice. So if you spend the whole of year 2 practicing whatever you need to practice to be ready to become an established pattern designer, what have you become at the end of that year? Before we answer that question, let’s define what practicing means for this example. As we stated in step 2: Identify your functions and set measurable objectives, being a pattern designer for example means a lot more than just sitting at your desk drawing or designing patterns. It’s about those production-, sales-, marketing-, financial-, logistic-, IT- and so on -tasks as well. And for year 2 those are areas where we would practice too - not just designing patterns. Which means we are growing our skills and doing a bit of actual work. And what does that give us? To be an experienced pattern designer. Being experienced might mean that you have tried a few things, done a couple of commissions, done a bit of client work. It could also mean that you have made some more patterns, perhaps learned something new, tried new techniques, tools, equipment etc. It also inspires accomplishments in how you have communicated your work to the world, through different types of communication platforms and activities, but not as much as reaching those sales-, product- and marketing functions objectives that you have set for year 3. It’s a step toward established, but not yet there. But there are different levels of experience you might think. And calling yourself experienced might sound exaggerated? But let me tell you, that is just your self criticism speaking. And this is the beauty of setting measurable objectives. When checking them off one by one you are providing yourself with evidence of your experience. Those are the facts. You can use them to prove to yourself and to the world that you have done the work. And setting the measurable objectives for your 2-year milestone is the next step. It’s done exactly like with the big goal objectives. 1. Ask questions about the milestone until it’s broken down into answers that can be formed as numbers, or a ”yes” or ”no”. - What does "experienced" mean to me in this context? (Replace "experienced" with your year 2 milestone". 2. Identify what needs to be done in order to reach those numbers. 3. Use the big corporate departments, functions and the sub functions to guide you. To help you work through these steps I have updated the workbook with a step 3 worksheet. Now go and fill in your year 2 vision/milestone and function/sub function ratios. Then we rinse and repeat for year 1. And now we are getting to a nearer future, defining where we will be in only one year, which is not that far away anymore. A great year 1 milestone should feel fully possible, yet challenging. If it's not, you're most probably already there or at least very close, which means you have to aim higher. 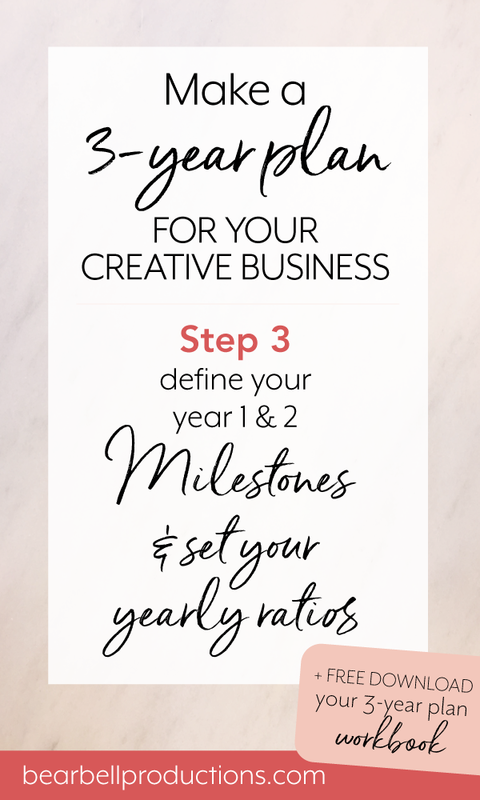 So let’s keep on working on the example and see what the year 1 milestone would look like for a small design business. As for the year 2 milestone let’s ask what would probably be a reasonable step towards that 2nd year milestone? What state would precede this? What would you be before becoming experienced? What comes before experienced? Looking back at my karate parable - where step 1 is about learning. Ok, so that sounds reasonable right? During the first year we would spend some time learning. But let’s widen our perspective a bit to include more than just studying and taking a bunch of courses. In order to start practicing and getting some experience during year 2, what would you need to have in place at the end of year 1? - Producing/designing sellable prints and products? - Selling my prints & products? - Marketing my prints & products? I think this is quite easy to answer at this point, am I right? And that’s because we’re so much closer to the position where we are right now. For producing/designing your answer might be a bulk of x practice patterns & collections where I can pull x patterns that I'm pleased with, a list of ideas for patterns and collections, knowledge how to make specific types of patterns. For selling your answer might be a web shop, a list of companies I want to work with. For marketing your answer might be a brand guideline document, a website, a blog, an Instagram account, Pinterest account etc. Year one can be about learning, acquiring new and immersed skills as well as setting up your business platforms and systems so that you can start practicing when year 2 arrives. So you can say that year one is about preparing. A complete pattern designer platform. A ready to go design business. Wow, I like that. It’s optimistic, enthusiastic and hungry. Totally motivating or what?! Which makes it a great goal and vision. And I know you can already envision the different functions objectives for this one right? Now go fill in that worksheet for year 1 too! Now you have a ladder toward your big goal - the milestones and objectives for year 2 and 1! Should you have mission milestones? You can se specific year 2 and 1 missions if you’d like, describing your contribution to the world during both years, but I think for simplicity and focus it’s totally fine to use the big mission statement for your milestones as well. It will give you consistency throughout your whole journey. The next step of the 3-year plan is getting even more hands on and down to business. In next weeks newsletter and article I’m going to share all my secret project manager skills, so get that planner ready! Oh, and one last thing. I'd really appreciate your feed back on these articles. Easy to follow and understand or not? And what about the worksheets, are they helping you or do they need to be more detailed? Comment below or send me an email at barbel@bearbell.se. If you're not on my newsletter list, here's your chance to sign up. Enter your name and email and you'll get articles, videos, tutorials, inspiration and news about the world of patterns, illustration, markers and running a creative business. I totally respect your privacy and will never spam your inbox, or hand over your information to anyone else. Ever.